Nan A. Talese, 9780385540933, 272pp. What is the relevance of morality today? 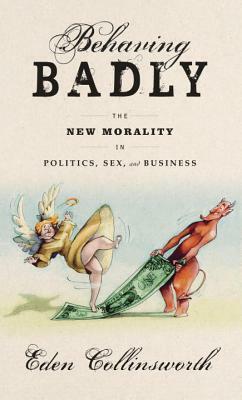 Eden Collinsworth enlists the famous, the infamous, and the heretofore unheard-of to unravel how we make moral choices in an increasingly complex—and ethically flexible—age. To call these unsettling times is an understatement: our political leaders are less and less respectable; in the realm of business, cheating, lying, and stealing are hazily defined; and in daily life, rapidly changing technology offers permission to act in ways inconceivable without it. Yet somehow, this hasn’t quite led to a complete free-for-all—people still draw lines around what is acceptable and what is not. Collinsworth sets out to understand how and why. In her intrepid quest, she squares off with a prime minister, the editor of London’s Financial Times, a holocaust survivor, a pop star, and a former commander of the U.S. Air Force to grapple with the impracticality of applying morals to foreign policy; precisely when morality gets lost in the making of money; what happens to morality without free will; whether “immoral” women are just those having a better time; why celebrities have become the new moral standard-bearers; and if testosterone is morality’s enemy or its hero. EDEN COLLINSWORTH is a former media executive and business consultant. She was president of Arbor House Publishing Co. and founder of the Los Angeles-based monthly lifestyle magazine, Buzz, before becoming a vice president at Hearst Corporation. In 2011—after writing a bestselling book in China for Chinese businessmen on Western deportment—she launched Collinsworth & Associates, a Beijing-based consulting company, which specialized in intercultural communication. The author of I Stand Corrected: How Teaching Western Manners in China Became Its Own Unforgettable Lesson, she currently lives in London.